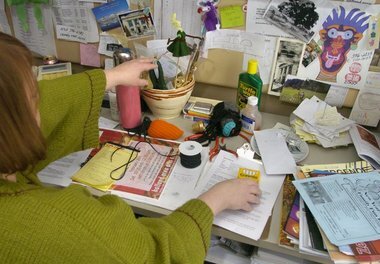 I came across an article explaining how messy desks cost $177 billion of lost productivity. This reminded me of two clients I recently worked with. When we organized their offices, we found almost $1,000 of gift cards kicking around in the recesses of their desk drawers. They were a couple years old by the time we unearthed them. Luckily, they were still valid, and we found a good home for them for future use. Messy desks cost you time and money. Those minutes spent daily hunting for misplaced files, staplers or documents add up to 76 hours — or nearly two work weeks — a year. Nearly one-third of office workers fail to get reimbursed for a business or travel expense because they misplaced or lost a receipt. Most people clean and purge their desks once a year, but it takes regular maintenance to keep it orderly. Once you set up a system for dealing with your paper work and projects, it only takes about 10 minutes a week to tidy up your office.